Commenters on orchid themed discussion forums often suggest "jewel orchids"(Anoectochilus chapaensis) as a great starter orchid for terrariums. The compact size and love of humidity makes them a natural for a terrarium environment - although you may not achieve the traditional orchid "look." 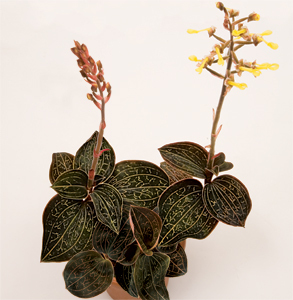 Have you ever owned a jewel orchid? I have tried two different jewel orchids in my vivarium. The one you picture here (which is stunningly gorgeous by the way) did not survive. The other one (Ludisia discolor) looked like it wouldn't make it either but actually started to thrive after a while. It has dark velvety leaves with red vertical stripes. Thanks for the tip, Tessa! I'd like to look into the Ludisia discolor.